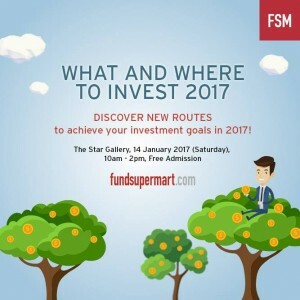 Join investment experts at Fundsupermart’s annual flagship seminar, WAWTI2017, where they will discuss the outlook for the brand new year and how you should position your portfolio to discover the best routes in achieving your investment goals for 2017! What and Where to Invest (WAWTI) is back again on 14 January 2017 with a brand new theme – Discover new routes to achieve your investment goals! Started in the year 2005, WAWTI is Fundsupermart’s annual flagship event to help investors to kick-start a brand new year with presentations from investment experts on market outlooks and investment opportunities. This event goes in line with Fundsupermart’s mission to help investors around the world invest globally and profitably. The theme of the seminar encompasses the idea of discovering new routes to achieving your investment goals. Be ready for a time of intriguing insights from industry veterans, including opportunities to interact with them. This year, we welcome experts from Fundsupermart, Allianz Global Investors, Legg Mason Global Asset Management and Lion Global Investors. They will also answer your hard-hitting questions during the panel discussion. That’s not all! You do not want to miss your chance to enjoy exclusive promotions, only for WAWTI2017 attendees!